Unless you have webbed feet or the DNA of the Man from Atlantis, the water shoe should be your best friend if water sports are your thing. Long gone are the days of clunky, ugly boat-like constructions that made your heart sink at the thought of putting them on your feet and left a lingering ‘wet dog’ odor in your gym bag / kit bag for days. Today’s water sports shoes have evolved to be practical, multi-talented and yup, dare we say it, even cool-looking, bringing a sandal/sneaker vibe to your time in, on and around the water. With a range of features, including water drainage, underfoot traction, thermal protection and cushioning, water shoes have certainly come a long way when it comes helping us make the most of the ocean. But their versatility doesn’t stop at the surf line, there are also water shoes designed to travel with you as well as super hybrid shoes and sandals for hikers who find themselves water logged out on the trail. So, whether you’re into kayaking, boating, board sports, scuba, open water swimming or simply being a beach or pool dude, there’s an aqua shoe designed to be your perfect water buddy. But before you splash out, we’ve put together a list of what we think are the best water shoes out there to keep you and your feet H20 happy. Love ‘em or loathe ‘em for their unconventional looks, there’s no denying the Croc is king when it comes to general water shoes. Tough, lightweight and fast-drying, the Croc’s polka-dot perforations also offer superior ventilation and drainage. But if looking too dad-like is a worry, then fear no more as the Swiftwater manages to give the Croc a casual hiker/outdoor feel without losing its unique styling or practicality. And, while you wouldn’t go out for an all-day hike in these bad boys, for general use when you’re mucking about by the water, on rocky beaches orriver banks, you really can’t go wrong with the super comfy and super grippy Swiftwater. Our handy guide to the top hiking shoes features more great products like this. 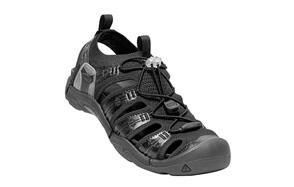 Now here’s a hiking shoe with hidden depths…stepping up as amphibious footwear when the going gets wet. Designed to take on relatively challenging terrain, this sturdy looking water sandal from Merrell also makes light work of wading through creeks, waterlogged land and mountain streams. Its waxy waterproof upper sheds water as if it is the proverbial duck’s back and the cut out back and side sections enable water to quickly drain. A Vibram outsole keeps you gripping wet ground as you blaze the trail. Aleander’s Aqua is a conventionally-styled sports shoe with surprisingly aquatic ambitions. Made from a breathable mesh upper with a rubber draining outsole, ingressed water simply has nowhere to hide in this cool-looking water shoe. The well-priced Aqua will take you from water’s edge to waterlogged without losing tread, with the rubber sole giving excellent traction and grip in slippery conditions, while its quick drying sock liner and internal cushioning creates a cooler and dryer foot environment. Lateral support sections keep your foot snug in the water. In short, the Aqua is a lightweight water shoe which happily goes where other athletic shoes wouldn’t dare to tread. Love these? Check out our review of the best water shoes for hiking for our top picks. Imagine the comfort of your slippers (go on, admit it, you do wear some) with the aquatic performance of a quality water sports shoe. Well, there’s no need to imagine, the team at Speedo have made it real. Their beach shoe, Surfwalker combines almost barefoot-like comfort with the right level of protection and support to keep you on the go, whether it’s on your board, in the surf or simply by the pool. The Surfwalker’s pull on design has mesh inserts for breathability and a cushioned insole for protection while its molded outsole grips like a limpet and streams water away. A relaxed, comfortable and flexible water shoe that is suitable for all day wear. The Neo Sport Premium is a clean looking, multi-purpose neoprene water bootoffering impressive thermal protection when the surf temperature drops. Coming in three mm thicknesses to match your seasonal or year-round water activity, there’s no reason not to keep on enjoying the life aquatic! This is a tough boot which will keep your feet toasty and protected, with strong zips, high ankle cuff and traction sole which effectively keeps a grip on both wet and muddy surfaces. A web entry barrier stops water flowing into the boot via the zip, making this hard wearing and value for money water shoedeal for kayaking, board water sports and scuba diving. To fully enjoy and capture your water activities, check out our waterproof camera review for our top picks. The Evofit One has just enough technical spec to catch the eye of the keen hiker looking to get a double-whammy in their water sandal. Super comfortable and made from moisture-wicking fabric, the Evofit ticks the boxes for a hardworking outdoor sandal, and has the support, protection and stability to make inroads when out hiking. It can then switch it up when the ground gives way to water, with a sure-footed grip on slippery surfaces or full immersion. They are a little pricey but if you are looking for a hardwearing, hiking/water shoehybrid, then the Evofit is a value-for-money contender. Don’t forget to get a good hiking watch and you are all set for your next adventure. With its sturdy sneaker design and Speedo pedigree, this super-light lacedswim shoe has an impressive no slip grip to keep you safe and secure in and around the water. 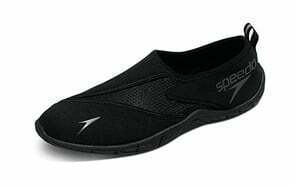 Great for swimming and navigating rocky waterlines, its quick dry system means you go from water to land with ease and with the Seaside’s almost tennis shoe looks, you can blend in with the (dry) crowd. Add in its breathable mesh upper, bungee cord closure and heel tab for speedy removal, and you’ve got a mid-priced, quality beach shoe that’ll keep you protected in and out of the water all day long. Is it a sneaker? Is it a water shoe? No, it’s the Amphibian Plus and when it comes to water sports, it likes to set its own rules! 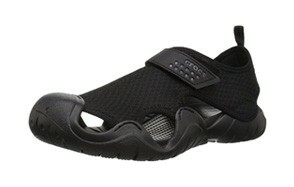 There is a cool, urban look to this water sport shoe that can take it from town or pool bar to open water in a splash. This is a multi-use water shoe that’s great for travelling as it is lightweight, versatile and comfortable. And it can step up when the situation takes you from dry to wet. The Amphibian Plus takes short or unchallenging hikes in its stride, making light work of wading in low level water and creeks thanks to its well-placed drainage ports. Rubber pods on its outsole gives sufficient grip and traction and its quick to dry mesh lined upper allows your feet to breathe. A stylish all-rounder for water activities that don’t demand too much. For more great sneakers, check out our white sneakers review. If you’re looking for a no- nonsense ‘does what it says on the tin’ water shoe, then the Jawpaw is the one for you. Its clean look makes the Jawpaw a pleasure to wear while its simple design hides some nice tech spec you’d expect from adidas to deal with a range of on-the-go water sports. Created for most water activities, the Jawpaw is also a good choice for beachcombing or walking around the pool as it offers good underfoot support and protection. Its climacool upper ventilates the whole foot, while its snug fit and perforated mid and outsole maximize water drainage. And, for excellent grip in slippy conditions, the Jawpaw’s tough ‘Stealth’ rubber sole steps up to the plate. All-in-all, this is a great performing, understated water sports shoe that takes the marine environment in its perfectly capable stride. Outdoor brand Columbia has come up trumps with the Drainmaker III, a good-looking hybrid shoe that wears like regular sneakers yet is equally good on land, boat or water. Yes, it is in mid to top price range, but you are gettinga well-made,hardwearingwater shoe that can cope with both rocky walking terrain and the open surf, all the while passing itself off as a good-looking hiking sneaker. The lightweight, breathable design makes it ideal for warm weather adventures and this shoe has your back as you go from trail to river to ocean…and everything in between. Relatively quick-drying, good ventilation, protective toe bumper, midsole ports for water drainage and with an omigrip outsole to keep you anchored, as an all-round hybrid water shoe with enough technical features, you can’t really go wrong with the Drainmaker III. Here’s a slip-on water sock with Nike’s sporting credentials that give you a protected, almost barefoot feel when out and about on the water. Described as one of their most ‘simplistic’, this is a real compliment for Nike’s 360 reboot of the iconic Aqua Sock, originally launched back in the ‘80s. Made from a two-layer mesh upper with foam heel and rubber outsole, the Aqua is an airy, scarily (in a good way) sock-like water sports shoe that gives you a natural amphibious feel without compromising on the necessary protection and support. Add in a foam heel clip and elastic collar for shoe security and strategically placed rubber pods on the outsole for flexibility and traction and you have a little beauty of an aqua shoet hat can more than justify its pricetag. 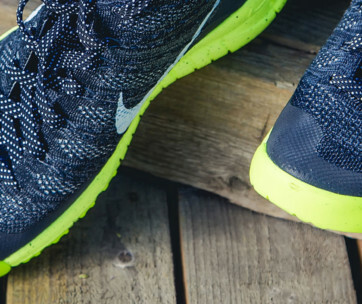 If you like Nike brand, make sure you check our Nike sneakers review as well. No water shoes review would be complete without a Vibram, with its unique styling enough to rival the quirky Croc. From the company that’ssynonymous with barefoot running, the natural and naked feel of Vibram’s land shoes has now found a home in the aquatic realm. Just like its land-based Vibram relatives, the Signa Athletic boating shoe has the distinct separate toe design, which on first glance has a rather Hobbit-like appeal. But don’t let that put you off, these are rather well thought out aqua shoes that allow you to feel the water around you while giving you just enough support and protection to keep you grounded. As a high-performing water shoe, the Signa is ultra-thin, flexible and lightweight, making it a great option for rowers, surfers, kayakers and paddleboarders who need grip and comfort as well as a natural connection to the water. For its minimalist feel, we like! Size - A snug fit is essential when it comes to water shoes as they will give a little when wet. A snug fit also means your shoe will not slip or slide off when you are getting active in the water and reduces the chance of chaffing. Most manufacturers carry standard sizes and may also cater for wide or slim fittings so read reviews and check sizing charts before you buy. Also look at how the fastening system on the shoe works and whether any laces or bungee pull systems are sufficient enough to keep your wet shoes firmly on your feet. Insole - Water shoes are not designed to be waterproof but to let some water in (and out). The inner sole of a water sports shoe should be flexible and provide cushioning and breathability as well as be easy draining and quick to dry. Some water shoes have fixed insoles, which can slow down drying but are more robust and stay put when you pull your wet shoe off at the end of the day. Outsole - You may want your water shoe to fit like a sock, but it needs a rock-solid bottom to keep your feet protected against wet, rocky terrain. A thicker sole with grip points and water drainage is ideal for hiking across wet and rough ground, while you can get away with a more flexible, thinner outsole if you are spending your time solely in the water. Whatever the style of water sports shoes you choose, make sure they have a durable outsole with good grip and traction and have some method of draining away water. Material - Water shoes are made of synthetic mesh or neoprene, depending on the type of activity they are used for. Mesh water shoes allow water ingress and are great for ventilation, so you could pick this material for hiking, boating, swimming, paddle sports and general beach or pool time. If cold is a concern or you need a boot that doesn’t let in (or out) too much water, then neoprene water shoes offer an extra level of thermal insulation protection. Choose neoprene water boots for scuba diving, open water swimming, surfing and board sports where toasty feet matter. Comfort - A shoe that keeps you comfortable both wet and dry is essential so check out the materials, design and cushioning in the water shoe before you buy. Rubber outsole, heel and cuff padding, tabs for easy pull on and off all help to keep your feet happy in the water but it is also how your water shoe behaves on the quayside that counts when it comes to comfort. Lightweight, easy draining and quick drying water sports shoes prevent your feet becoming waterlogged and irritated and your shoe from weighing you down. Durability - Although you’ll want a lightweight water shoe, it also needs to be tough enough to weather a variety of wet and dry terrains and to last more than one summer. Watersports shoeswith a thicker sole will last longer but make sure you are still choosing the right shoe for your activity (e.g. when swimming, you don’t want a clog-like shoe weighing you down). Check for materials used and look at brand reviews to see which aqua shoes or water sandals are the most durable for your sport. Breathability - Water shoesare often made with mesh material for breathability, helping to keep feet cool and quick drying when out of the water. Good ventilation – either though mesh material or drainage holes in the upper and midsole -also allows for good water flow in and out of the shoe when submerged and better drainage once out of the water. Q: What are water shoes? A: A water shoe is a type of tough but light footwear used for activities where your feet are likely to get... well… wet !They’re typically made of mesh and/or neoprene with a rubber sole,so you can get grippy while protecting your feet. Water sports shoes are specifically designed for water-based activities such as surfing, kayaking, scuba diving and paddle boarding as well as hanging out on the beach and surf line. They are made of lightweight material that allows water to flow out and a harder sole to cushion and protect your feet when walking or wading in wet and rocky environments. Hybrid walking/aqua shoes are also available, which are built strong enough for everyday hiking but can cope when the conditions get soggy or there are rivers and creeks to wade. Q: Why get water shoes? A: Your feet are your stability anchors so to keep active, you need to make sure they are protected and comfortable in any situation you put them in. With the added element of water, ordinary sports shoes or everyday sneakers simply won’t stand up in aquatic activities. At best you will get waterlogged and blistered, at worst you will slip and could get seriously hurt. Protection and support, grip and traction, comfort and warmth, lightweight, quick draining and quick drying – these are all the specific features of a water sports shoe that will make your time in, on and under the water a total blast. Q: What are the best activities you can do with water shoes? A: There’s a water sports shoe for most types of water-related activities so do your research first to get the perfect match. Water shoes are essential to get the most out of a wide range of water-based sports, including boating, paddle sports, surfing/windsurfing, scuba diving, fishing, swimming, coasteering and hiking in wet terrain. Water shoes and beach shoes are also advisable when exploring the coastline and beaches and can offer extra protection around the swimming pool. Q: Do you wear socks with water shoes? A: Most water shoes and sandals are designed to be close fitting and warm enough to wear without socks, in fact the more scuba or surfer type shoes are almost sock-like themselves. But there are times – and types of water shoe – where you could consider teaming up with a pair of socks. Some water sports shoes may not offer enough thermal protection to keep your toes warm,so you could look at getting a pair of neoprene socks to turn up the heat. 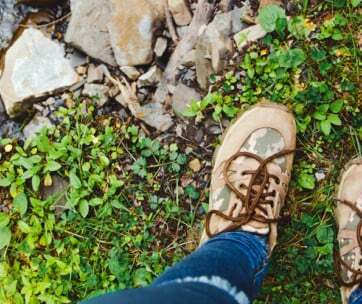 Similarly, if you are looking for a water shoe as a hiking hybrid and plan to do some off-path, rough terrain walking or prolonged hiking, then a pair of socks can help prevent blisters and rubbing. Q: How to wash water shoes? A: By the nature of the synthetic materials they are made of, water environments they are made for, and the feet that go in them, water shoes do have the tendency to get a bit stinky if you don’t head it off at the pass. The secret is to rinse your water shoes in fresh, clean and luke-warm water after every use and dry them thoroughly. Then regularly give them a full wash treatment – warm, fresh water and either a wetsuit soap or mild shampoo will be enough – and scrub them inside and out before hanging out to dry. If they are still a little ripe, sprinkle the insides with some bicarb and leave overnight, before rinsing and drying thoroughly.